Phyllis was born to Josiah and Winnifred Kearley of Sop’s Arm, NL. She married Archibald Patey of little Brehat on July 18th, 1945. They raised ten children happily together in St. Anthony. Phyllis loved to cook, bake, knit, and especially sing and spend time with her grandchildren. Phyllis passed away in to perfect peace with her family around her at the John M. Gray Center in St. Anthony on the 4th of September, 2014 at the age of 87 years. Left with a lifetime of loving memories are her sons Rex (Leah), Don (Masie), Terry (Karen), Randy (Mary), Glenn (Gail), Kirby (Glennis) her Daughters Thelma (Lew), Judy (Ernie), Daughter in law Millicent, 25 Grandchildren and 26 Great- Grandchildren, she will be forever loved and sadly missed by all her knew her. 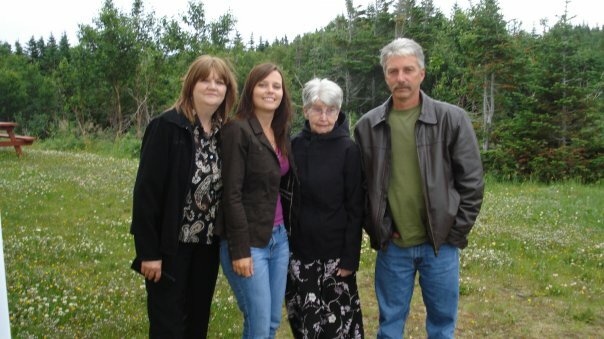 Phyllis lived to see the passing of her Husband Archibald Patey, her sons Dennis Patey and Darren Patey and her granddaughter Treena Patey. Visitation was held at the Pentecostal Church in St. Anthony, from which the funeral service took place at 2:00pm on Saturday September 6th with Pastor Jeff Bessey officiating. Burial followed in the St. Anthony Pentecostal Cemetery. Funeral Arrangements were entrusted to Kerry M. Fillatres Funeral Home, St. Anthony NL, Siobhan Mauger Funeral Director.